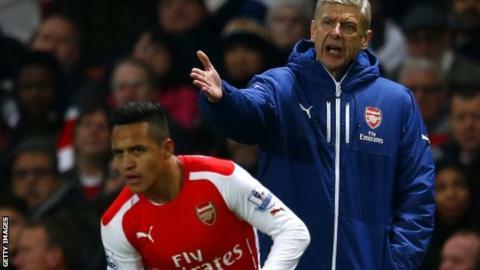 No player has settled into the Premier League quicker than Alexis Sanchez, according to Arsenal boss Arsene Wenger. The Chile forward, who joined from Barcelona in July, scored his ninth top-flight goal of the season in the Gunners's 1-0 win over Southampton. "It is difficult to find examples of people who have settled so quickly," said Wenger. "Quicker, you cannot. "He has such a will to win, which is why he always finds something special." Sanchez has now scored 14 goals in 22 appearances for the Londoners in all competitions since moving from the Nou Camp for a fee in the region of £35m. It is the first time the 25-year-old has scored as many as nine goals after 14 league matches in European football, having previously recorded eight in 14 at Barcelona last season. He scored 47 goals in 141 appearances for Barca and netted twice for his country in the World Cup in Brazil. "When you look at the goals and the impact he has, it is fabulous," said Wenger. Sanchez's 89th-minute winner secured a third consecutive win on Wednesday for the Gunners, moving them into the Premier League top six and just three points below third-placed Southampton. It was the Saints's second consecutive defeat in the league but Wenger believes Ronald Koeman's men are realistic top-four contenders. "He can play in any league in the world. The English game is well suited to him. He is a hard worker with a knack for goal. He has had a massive impact in a very short space of time. For weeks, months and years to come I think he will be a wonderful player for Arsenal." "Don't bury them too quickly," he said. "They are a good side and they played very well. "It was a victory of patience and intelligence and we kept our structure well. "We were more fluent, sharper and quicker against Manchester United but we exposed ourselves. We learnt a lesson maybe, we were too impatient and today we were patient until we scored at the end."